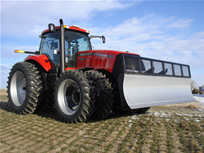 We custom design to fit your individual tractor. Otter's Inc. is a family owned operation, building angle dozer blades since 1958. The company's founder, Marion Otter previously operated under the title of Otter Manufacturing until 1997 when he retired. He then turned the company over to his sons, Frank and Greg Otter, presently, Otter's Incorporated. 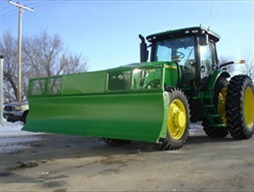 An Otter Angle Dozer gives you maximum use from your tractor year-round for snow removal, packing silage, terrace repair, cleaning feedlots, etc. 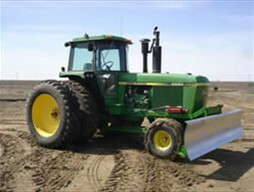 Otter's will custom design blades to fit your individual tractor. 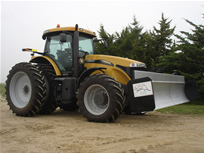 Otter's offers balanced and pivotal dozer blades for the standard 2-wheel drive tractor with optional widths of 9 ft., 10 ft., 11 ft., and 12 ft. The blade mounts close to the front wheel for best control, has easy suitcase linkage for angle change and activates from a standard 8-inch cylinder which is included. 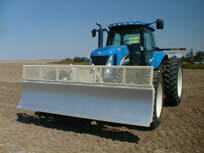 The push frame is designed to take the beating that a dozer gets on the corner. 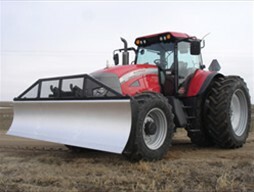 For the mechanical front wheel standard 4-wheel drive tractor there are optional widths of 10 ft., 12 ft., and 14 ft. and optional accessories offered. "Think Otter" for your pushing, packing and cleaning. Contact us for more information or questions at Phone: 785-567-4648, Fax: 785-567-4629. 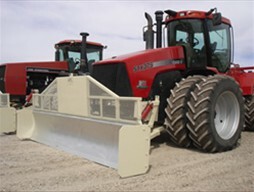 E-mail: ottersinc@ruraltel.net, Website: www.otterdozer.com.